Sounds perfect, right? 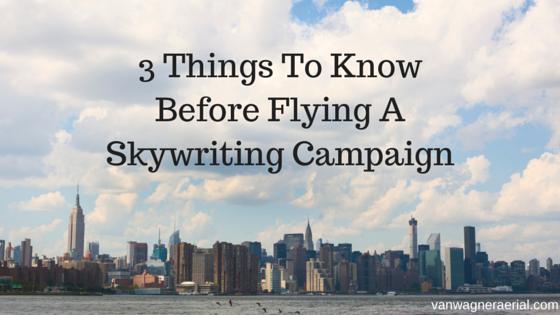 But before jumping in to your first skywriting campaign there are a few things you should consider. Skywriting – A single plane is typically used to perform skywriting. In this method, the plane performs a series of loops and twists to spell out each letter individually. A pilot will weave and twist the plane through the air, creating a visual performance that’s bound to get consumer’s attention on the ground below. Often, skywriting messages are one word e.g. “smile” or a visual like a heart or simple logo. Skywriting works well with short, succinct messages and can last 1 to 2 minutes. Sky typing – During sky typing, five planes fly in a parallel formation while emitting small spurts of smoke. The spurts eventually grow to make up a dot matrix that eventually spells out individual letters. Each plane is equipped with an on-board computer that determines when smoke is released, this ensures precision and accuracy. Sky typing messages are typically longer than skywriting messages and last somewhere between 3 and 7 minutes depending on weather conditions. The dot matrix message can reach around 10,000 feet long with each letter standing at over 1,000 feet from top to bottom. Once you have determined which option is right for your brand, and have a clear understanding of what you would like to say, the next step is to pick a location to fly. Who is your target audience? • Are you looking to target consumers at the beach? • Attendees at a major tech conference happening in the area? • An outdoor concert or music festival? • A sporting event? The Super Bowl? No matter which type of event you choose to fly, make sure that you are picking a location and time of day that is optimal for impressions. For instance, if you are planning to fly the beach, you would want to fly between 10 AM and 3 PM. If you are looking to fly a major conference, determine when most people will be coming to or leaving the event. In one online forum a person asked, “How can I get the attention of someone high-profile like Mark Zuckerberg?” You may not be able to pick up the phone and call Mark Zuckerberg, but you can be pretty certain that he would look up and notice a sky message flying overhead. If you are looking to get a specific person or demographics’ attention, skywriting and sky typing is an incredibly impactful media buy. 3. How Much Does Skywriting/ Sky Typing Cost? Skywriting and sky typing costs are contingent on a variety of factors: length of message, location of flight, frequency (multiple flights), date, and event specifics. For instance, the Academy Awards or the Super Bowl may be subject to competitive pricing. When choosing a skywriting service, make sure you are partnering with a reputable company. Van Wagner Aerial Media has been in the aerial advertising industry for over six decades and is the only truly national aerial advertising company with planes stationed in markets from coast to coast. Our aerial coordinators are here to discuss your campaign goals and put together a skywriting plan that achieves your desired results. Contact us today or click below for a free quote.